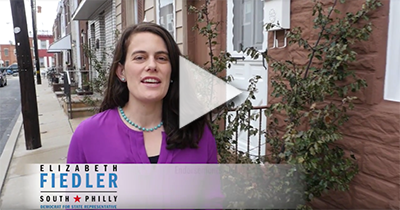 Philadelphia, PA — Today, a dozen community leaders from across South Philadelphia threw their support behind Elizabeth Fiedler’s campaign for State Representative in Pennsylvania’s 184th District. The impressive spectrum of leaders makes South Philadelphia better everyday through community-building and work in local schools and parks. Their backing of Fiedler reflects the candidate’s broad base of support across the district. Thoai Nguyen, a Lower Moyamensing resident, said Fiedler’s stances on universal health care and public education resonate with him, as does the need to “transform our democratic process to level the playing field for working-class Philadelphians.” Nguyen said he is confident Fiedler “will bring much needed integrity and accessibility” to the seat and to her constituents in the 184th District. Nichole Girgenti, a community leader from East Passyunk Crossing, voiced her support and said that Fiedler’s platform aligns with her own family’s values about investing in the entire community.